On April 12, at the initiative of the Department of Foreign Philology, the annual International Scientific Forum “Language Education in Kazakhstan in the Context of Globalization” was held at KSU. Within the framework of the forum master classes were organized by foreign teachers of the Nazarbayev school, as well as teachers and undergraduates of the Department of Foreign Philology. 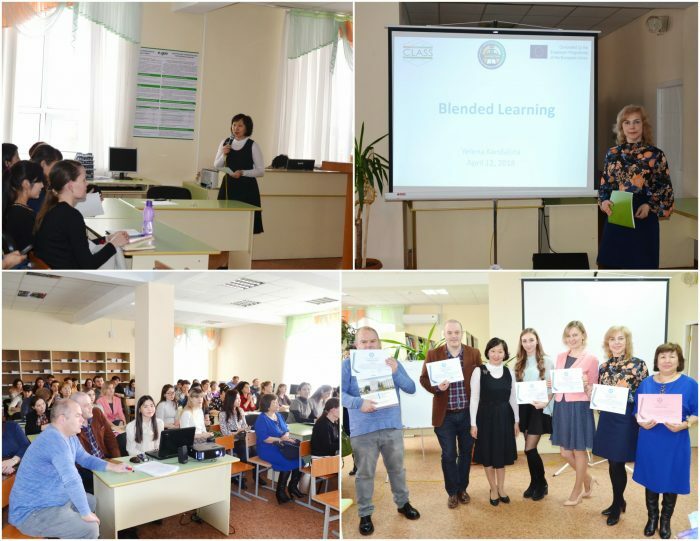 Among the listeners of the master classes were: teachers Nazarbayev intellectual schools, English language teachers of the city and region, teachers of KSU, Kostanay State Pedagogical University, Kostanay Teachers College. The subjects of the master classes covered topical issues of the methodology of teaching English. Among the speakers were teachers from England: Mark O’Brein and Richard Edain, associate professor of the Department of Foreign Philology E.M.Kandalina, undergraduate 2 years of study Nina Shandetskaya, 2nd year student of the specialty “Foreign Philology” Margarita Zaitseva. The forum participants noted the good organization of this event and the fruitful work during the master classes, and also expressed their wishes for continuing cooperation. All participants were presented with gifts and certificates. Check out ENU’s Video Roller for CLASS! Our Facebook Group Page is up and running!